I’m surprised the idea of street still has such relevance as a gauge of authenticity in Hip Hop Culture. This is a capitalistic era where experiences are manufactured and imagined for a consumer audience who often does not have a clue. Street culture and music can make a profit. For the most part, today’s idea and interpretation of street music is often subjected to trend and demand – what was once representative of inner city black America is now also synonymous with manicured lawns in the ‘burbs. To be street is an option, not a requirement; a business move instead of an experience. Initially, street music that was released or absorbed into mainstream American culture spoke to the chaos and anxiety African-Americans were facing. The street was a designated space of struggle and survival, often negative but always a marker of one’s authenticity and reality. Street rap, like its predecessors, provided a space for discussing the dangers of being black. Cue Public Enemy’s 1990 release Fear of a Black Planet, with the anthems “Fight the Power,” “911 is a Joke,” and “Welcome to the Terror Dome.” They defined street rap as protest music, speaking to tragedies of police brutality, poverty, and why being black in America was such a damn raw deal. Jeezy’s branding of his life and music represents a fairly recent trend in rap music to trademark one’s experience in order to observe and authenticate them – “If I verbally and entrepreneurially claim rights to what I’ve been through and put it on wax no one can test me.” There is a dual need to prove one’s lived experience in the literal street and that of the public imagination. Often these two space conflict and cause friction for the artist personally and otherwise – look at T.I.’s T.I. vs. T.I.P. (2007). Jeezy appears to have mastered that delicate line and it suits him well. 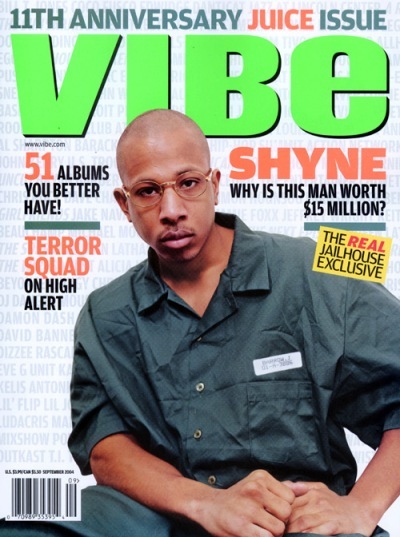 Shyne, however, is extremely unique for two reasons –he is international (literally) and was most active in the previous decade. What was most intriguing about Shyne’s interview was not only his brutal honesty about his situation but his dedication to the resuscitation of his home country of Belize and street culture. His answers read like a throwback black nationalist, (re)dedicating his life and music to represent “doin’ what’s right for sufferers and for poor people and for muthufuckas on the bottom.” Shyne’s international perspective is especially intriguing because it aligns most closely to the purpose of street culture from the 1960s in America and that ideology of ‘by whatever means necessary’ (cue your power fist, folks!). Even more gangsta about this man is his refusal (inability?) to distinguish the barriers between his music, his persona, and Hip Hop as a business. There is no distinction between street and reality. One has to wonder if Shyne’s brand of music even fits into today’s scene because of how, dare I say, authentic he seemingly proves himself to be. If he never comes back to the U.S., he can always get Wood Harris to perform for him. You know they’re twins, right?